UPDATE: In an effort to hold myself accountable to these predictions, the weekly results (however ugly they are) will be tracked in both spreadsheets with weekly recaps at the tail end of the post. Let's go Rams! College football IS LESS THAN A WEEK AWAY, so it seemed appropriate to provide my loyal readers (hi, Mom) my predictions for the upcoming 2018 Colorado State Ram football season. Not what you are expecting? While I am 93% certain that my prediction above will not come to fruition, I head into this season with the words of Herm Edwards on my brain - you play to win the game. This Ram season is setting itself up to be one of the most intriguing seasons in recent history. We are in season four of the Mike Bobo regime with the preceding three seasons all ending with records of 7-6, a bowl game loss, and an overall 2-7 record against our three primary rivals (CU, Wyo, AFA). The McElwain recruits are mostly gone - this is now a Mike Bobo recruited team. During his time in Fort Collins, Bobo has yet to push CSU to the top of the Mountain West - a feat that looked so achievable last year until late game collapses undermined that goal. With his recruiting classes in place and three straight winning seasons in his back pocket, Bobo looks to make that next step in 2018. Bobo's next attempt at making that leap was greeted with several challenges in the off-season - most importantly, taking care of his own health. Bobo's health issues have led to him spending the week preceding the first game of the year in a Denver-area hospital undergoing testing for numbness in his legs. My personal interactions with Coach Bobo have been incredibly positive as he is an engaging and hospitable man and a great representative of my university. I wish him all the best as they try to figure out his diagnosis. A missing head coach is one of the many challenges that the Rams face as they enter this new season. Last year's Ram squad that was so incredibly close to taking that next step will have a massive overhaul on the starting lineup. Per the Coloradoan, CSU will have the least experienced starting roster in college football this year. Only eight starters return in 2018 to lead the Rams into one of the toughest non-conference schedule they have seen in a long while. Three of the four are Power 5 schools. Two are from the SEC. Their leading returning receiver has a total of 71 catches in his career. The Rams lost their starting quarterback (Nick Stevens), a 3rd round NFL draft pick (Michael Gallup), arguably their three best offensive linemen (Jake Bennett, Zack Golditch, Trae Moxley), their explosive starting running back (Dalyn Dawkins), their offensive coordinator (Will Friend), their defensive coordinator (Marty English), and Comatose (just for the summer). In addition, their slated starting quarterback (Collin Hill) tore his ACL playing basketball and may not be back until later in the season (although he is reportedly way ahead of schedule). To shore up his coaching staff, Bobo brought in Dave Johnson from the University of Ohio as offensive coordinator and tasked new defensive coordinator John Jancek with fixing a troubled defense. Bobo has a prior history with both new coordinators having worked with them at Georgia. This familiarity should help smooth the transition between coaching staffs and provide some continuity for his young squad. The Rams lost multiple games last year due to inability to close out games on the defensive side of the ball, leading to the short retirement of defensive coordinator Marty English. The Rams fan base is hoping that his replacement, John Jancek, improves the players' understanding of their defensive assignments and (this is the tricky part) their ability to actually make a tackle. Most importantly, both new coaches are serious about football. So freaking serious. While their starting lineup has been depleted, there is ample amounts of talent across the roster. This is especially true on the offensive side of the ball where the Rams have a talented and deep crew of skill position players: running backs Izzy Matthews, Rashaad Boddie, Marvin Kinsey, Marcus McElroy and receivers Bisi Johnson, Warren Jackson, and newly reinstated Preston Williams headline an impressive group of players who should become offensive forces in the Mountain West. The Rams also grabbed a graduate transfer quarterback from Washington in K.J. Carta-Samuels, who looks to be the starter entering the Week 0 game against Hawaii. Justice McCoy, a redshirt freshman out of Lousiana, has made a strong case to back up KJCS as the season starts. On the defensive side of the ball, the Rams happily saw the return of Jamal Hicks from his season-ending arm injury last year - an injury that dramatically altered the identity of the defense after his departure. Jordan Fogal was granted a sixth year of eligibility in December. The linebacker corps of Josh Watson, Tre Thomas, and Max McDonald was a strength last year and should be improved in 2018. The emergence of Arjay Jean and Richard King on the defensive line last year give me hope that the defensive unit will show significant improvement under the tutelage of Jancek. The schedule breaks down into three categories. The Rams have four games they HAVE to win (Hawaii, Illinois State, at San Jose State, Utah State). They have three games in which they will be significant underdogs (Arkansas, at Florida, at Boise State). The remaining five games should be competitive and could go either way (Colorado, New Mexico, Wyoming, at Nevada, Air Force). Three of those five coin-flip games are against rivalry opponents that Mike Bobo has struggled to defeat during his tenure in Fort Collins (what are trophies again?). Assuming CSU takes care of business at home against Hawaii in Week 0 and Illinois State in Week 4, a win against either CU or Arkansas would set them up to be 3-2 coming out of their non-conference schedule. I would be happy at 3-2, ecstatic at 4-1, and uncontrollably emotional at 5-0. With either a 2-3 or 3-2 start, the Rams should still have the ability to reach 8 or 9 wins on the season. That game went nothing like anyone expected. Hawaii came to Fort Collins a heavy underdog with a spread somewhere in the 14 to 17 point range. Yet from the opening kickoff, their run-and-gun offense had no problems against our new-look John Jancek defense. Saturday's problems were a carbon copy of what plagued the defense last year - poor tackling and terrible gap control. In his post-game press conference, Bobo stated that the adjustments made during the game did little to change the effectiveness of the Hawaii quarterback Cole McDonald. When CSU lined up five men in the box to defend against the pass, Hawaii was able to run through massive holes in the defense (including 96 yards and two TDs from McDonald). When CSU lined up 6 men in the box to stop the run, McDonald picked apart a secondary that had been highly touted this past offseason. The secondary had no help from the defensive front, who barely stepped foot in the backfield with little to no pressure on the quarterback most of the game. By the time the Rams realized what was going on, the game was out of hand. This early and large deficit created an opportunity for KJ Carta-Samuels and the offense to show the Ram faithful what they could bring to the table. And boy, did we get a glimpse of what this offense could do. Outside of some breakdowns in pass protection with a still-gelling offensive line and a few missed open receivers, the offense put together a solid effort that excited me for the rest of the season. The clean routes of Bisi Johnson combined with the freakish size, strength, and athleticism of the Warren Jackson/Preston Williams duo provides some optimism out of a tough afternoon. Williams in particular showed why he was highly recruited out of high school, making difficult catches look easy, running away from defenders at times, and running over them if needed. Between the receiving corps, Griffin Hammer (who had an impressive catch and run through several defensive players), Cameron Butler (who left the game with a leg injury in the second half), and the backfield of Izzy Matthews and Marcus McElroy, the CSU offense looked capable of putting points on any defense they will face this year. Carta-Samuels set a CSU record for passing yards in a game with 537 yards and 5 touchdowns. Williams and Johnson each caught two of his touchdown passes in addition to their 188 and 157 yards receiving. It has taken me a while to put words to the emotions from Friday night. While the Hawaii loss was still a loss, I left that game with a sense of hope for the season. The team did not quit and turned a first half blowout into a one-score game in the second half. I was hoping the humbling nature of a conference loss at home would send the team down a path of renewed vigor and effort. My optimism died sometime during the first quarter of game number two. As the Rams won the coin flip, Robert stated what we all were thinking: "Take the ball. I don't want to see the defense give away the lead right away." Instead, CSU deferred and CU marched down the field with a 5 play, 75 yard touchdown drive to take the early 7-0 lead. The source of my hope then trotted out onto the field, proceeded to run the ball four times, throw one pass, take a sack, then punt the ball away. One minute and thirty-seven seconds later, CU scored another touchdown to go up 14-0. The Rams responded with a solid drive capped by a Bisi Johnson touchdown from KJ Carta-Samuels to bring the game back to a touchdown deficit. And then the wheels came off. 21-7. 28-7. 28-10. Half time. 35-10. 42-10. 45-10. 45-13. Ballgame. Walk of shame. Gatorade of shame. Drive home of shame. Sleep of shame. Morning of shame. Weekend of shame. Tuesday morning at work of shame. This defense is lost. Defensive ends get too far up-field, opening gargantuan running lanes in the middle of our defensive front. The secondary cannot cover anyone with speed. The entire defense takes bad lines to the ball carrier, opening up the field for the offense. When they do get a helmet on the ball carrier, they miss tackles. It is not good. Some might say bad. While I cannot verify this information (do not look it up), I do not feel that Stephen Montez completed one pass more than 10 yards downfield. Everything was underneath: either a short screen or a running back out of the backfield. Montez was inaccurate throwing downfield (his interception came on one of those plays), but he had no reason to force the issue. The Buffs were cranking out 15+ yard plays by just dinking and dunking down the field and, like Hawaii's shovel pass from a week before, the Rams could do nothing to stop it. Incredibly frustrating to watch. What made things worse was the ineptitude of the offense. The play calling tried desperately to establish the run, despite having a severe disadvantage in the trenches, talent at the wide receiver position, an inexperienced CU secondary, and an early and deep hole to climb out of (thanks, defense). At multiple points during the game, CU was playing their safeties to the inside of the field and only 10 to 15 yards off the line of scrimmage. Their cornerbacks were in press coverage, only to drop back before the snap. CSU had man-to-man single coverage on the outside with 6'-6" receivers against a 5'-10" cornerback and the offense did not adjust accordingly. It was during those moments that I realized how great it was having Nick Stevens on this team last year. While his arm was not the best, he quickly recognized those mismatches and put the offense in a position where they could be successful. That chemistry and unspoken understanding that we experienced with Stevens and Michael Gallup is not there with KJCS and his receivers. Is this breakdown due a lack of playing time between KJCS and his receivers? Will it improve when Collin Hill returns to the starting lineup (he did make a short appearance in the second half)? The main target of my anger on Friday was not directed at the offense or the defense. Nor was it directed toward the special teams. It was the sign guy on the sidelines. Sign guy is a big bearded fellow who holds up a sign with the potential next play on it. For example, if the CSU offense was on the field and it was 3rd and 6, sign guy would run over to his stack of stupid signs and hold up "PUNT". These guys have been playing football for years. They have the athletic ability and game understanding to play at a Division I level program (please hold the CSU/Division I jokes... too early). If they do not know that there is a chance that the play immediately following a 3rd and long situation could be a punt, they should not be on the team. Plus, CSU is 0-2 in the Sign Guy EraTM. Imagine watching the Hawaii game at Canvas Stadium. Then imagine watching the Rocky Mountain Showdown at Broncos Stadium. Then imagine wandering into Canvas Stadium to watch that same team take on the SEC contingent from Fayetteville. Then imagine sitting in the stands at halftime having each scored three times (three FG for CSU, two FG and a TD for Arkansas). Then imagine watching the Razorbacks go up 18 points in the third quarter. Then IMAGINE SCORING TWENTY FIVE UNANSWERED POINTS TO TAKE THE LEAD WITH A IZZY MATTHEWS TOUCHDOWN WITH EIGHT SECONDS LEFT IN THE GAME. Then imagine not having a voice the next day. The Rams entered the contest as 14 point underdogs; a team struggling to find itself (or do anything) defensively. Yet the first drive of the Razorbacks resulted in a Jordan Fogal interception only three plays into the game. The Rams would score a field goal to take an early lead. After a few swapped punts, the Razorbacks appeared to turn on their switch. The big uglies with the metallic red lids realized that they were from the SEC and they were bigger and stronger than the men across the line. They marched down the field with a run-heavy approach, getting yards in giant clips on the ground. But CSU's defense did not break. On a 3rd and 6 play from CSU's 32 yard line, the Rams defense allowed a one yard gain setting up a field goal attempt. The kick went wide, but an offside penalty kept the drive alive. Four straight running plays later, the Razorbacks were in the end zone, the lead was gone, and the game was over. When the cannon fired at halftime, my buddy Jason joked that we were basically tied because we had each scored three times so it was a push. The Rams were down four, but it was the offense that had been the problem. The running game was non-existent. At the half, the Rams had a yard rushing. One. A single yard. The Arkansas defensive front was getting an excellent push and the play calling was not helping at all. Draw plays do not work when the defensive line gets to the quarterback as he is handing the ball off. Sweep plays do not work when the linebackers get to the edge before the running back does. The Arkansas defense was so good with their backside protection. The Rams would run right, find no holes, and cut back into the arms of a defender. The lack of a run game was putting the offense in third and long situations and those drives were stalling out. The best part of a failing offense was that we got to watch Ryan Stonehouse punt. Stonehouse and his exquisite lettuce punted five times with an average of 56.8 yards per punt and a long punt of 70(!) yards. Like his mane, his punting was magnificent. Despite how much the offense tried to let the Razorbacks slip away, the Rams were still in the game at halftime because the previously porous Ram defense had played well - including getting two interceptions. Unfortunately, the offense had only been able to produce six points on the resulting possessions. And while the Razorbacks flexed their muscles in the running game, the Ram defense maintained their assignments in the second level and the tackled far better than the first two games of the season. Arkansas was dominating up front, but they were not getting the explosive plays that had doomed the Rams all season. It was refreshing to see that the results were finally matching the efforts on the defensive side of the ball. The third quarter began and it appeared that Arkansas was done messing around. They pounded the rock and built up a comfortable 18 point lead. Canvas Stadium started emptying out. With five and half minutes left in the third quarter, the Rams offense stepped on the field after an Arkansas missed field goal. The attempts at getting a running game started were over. The game was now in the hands of KJ Carta-Samuels, Preston Williams, Cameron Butler, and Bisi Johnson. And they took over the game. Touchdown - Preston God Williams. Arkansas punt. Touchdown - Preston God Williams. Arkansas punt. Field goal - Wyatt Bryan. Tie ballgame. 5:19 remaining. Despite the jabroni idiots who left early, Canvas Stadium was LOUD. But the defense needed a stop. A quick ten yard play on first down looked ominous. Then a four yard run. Then a two yard run. Then on third and four, Emmanuel Jones beat his opponent and sacked Cole Kelley for a 12 yard loss. The Rams were getting the ball back for one last chance. What a statement win from a program on the brink. What a testament to the people in the locker room and the coaching offices for continuing to exert maximum effort in order to correct the trajectory of the program. What a challenge to turn this victory into momentum heading into Gainsville next week. As always, I am proud to be a CSU Ram. I am happy to report that the CSU Rams concluded their SEC portion of their schedule with a solid 1-1 record. I am convinced that no one would have complained about that before the season, but Saturday's game felt like a wasted opportunity. Fresh off the come-from-behind win against the Fayetteville Piggies, CSU was primed for a competitive showing in the Swamp of Gainsville. AND THE DEFENSE SHOWED UP!! But the running game did not. And special teams just pooped down their leg the whole game. Let's talk about the special teams. Add in the two additional fumbles and the entire game consisted of CSU putting Florida in a position to win the game. Florida leads Colorado State 41-10 in the fourth quarter. 34 of Florida’s points are a direct result of disasterous special teams by CSU or a turnover. Gators have engineered only 1 drive. You are not going to win many games with that formula. It took me five games to start regretting my decision to pick the outcome of each game and follow up each game with a recap. Why oh why did this have to be the season where I put myself out there?! 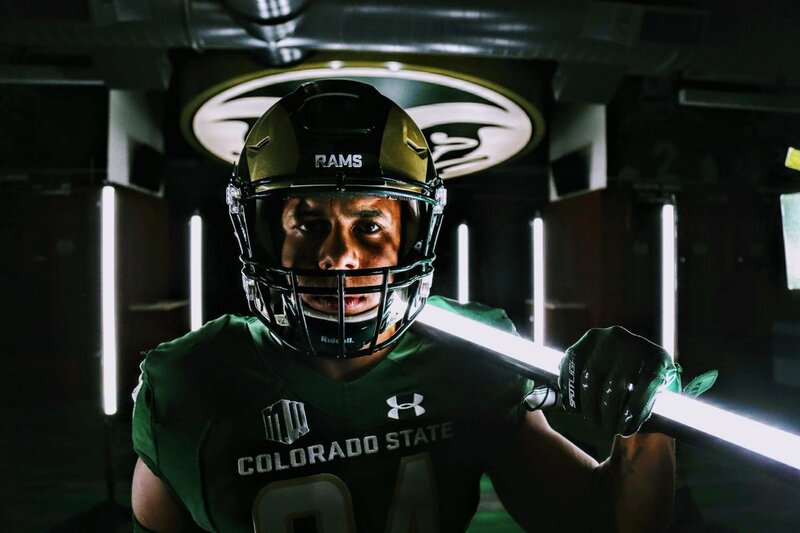 Prior to this week's game, Kelly Lyell of the Fort Collins Coloradoan penned an article titled, "CSU Football's 3 Biggest Problems Need Fixing Fast." My buddy's response summed it up best. Offense, defense, and special teams? That tweet became flesh and dwelt in front of us on Saturday as each unit tried desperately to be the worst unit on the field. The running game started with three rushes for a total of 19 yards. The running game decided that it had enough football for the day and, for the remainder of the game, retreated back into the hole where it has been hiding all year. KJ Carta-Samuels under-threw a ball to Bisi Johnson that turned an easy touchdown into an interception. The defense forced 3rd and 19 early in the fourth quarter and then proceeded to give up a 60 yard touchdown on the following snap. Wyatt Bryan missed a PAT. As fans of CSU football, losing football is not a foreign concept. We experienced the tail end of the Sonny days. We lived through Steve Fairchild. Yet we thought we were moving away from that. Between McElwain and Bobo, the recruiting rankings have steadily risen each year. McElwain clearly had turned the trajectory upward. McElwain's departure and Bobo's arrival appeared to be a slight hiccup, but the ascension of the program was never in question. Even last year with the same 7-6 record of the past seasons felt like progress. CSU needed to learn to finish games and we would be watching a 10 win team. That feeling is gone. That progress feels lost. What we are witnessing is a sieve masquerading as an offensive line, a defense that cannot stop tripping over themselves, and a special teams group that is best described as a human version of doinking (that's a technical term) a PAT off the upright. This team is bad. While I do not enjoy bad losses at home, I still love sitting at Canvas Stadium with my favorite people. The weather was warm but tolerable as we celebrated the sun disappearing behind the press box above us. The discussion lively jumped from the debacle on the field to the debacle on the sidelines. How much was Bobo's health a factor? Are the offensive struggles due to the play calling of Ronnie Letson or a struggling offensive line? Was Will Friend a bigger part of the offense than we thought? Is talent or scheme to blame on the defensive side of the ball? What is the NCAA record for missed tackles in a season? In which game will CSU surpass that record? Can you fire a defensive coordinator at halftime? Can you fire a defensive coordinator in the middle of the third quarter? Can I personally fire the defensive coordinator? Terrible. Horrible. No good. Very bad. This game would even have been ugly in Australia. If your idea of a good time is sitting on a roller coaster for 4 straight hours twisting a giant knot into your stomach, then you loved watching this game. The contest started exactly how it should should start when you play a bottom 10 FBS team - you dominate. Fourteen points in the first quarter. Fourteen points in the second quarter. A stout defensive effort. Dominance on both lines. An appearance by the running game we anticipated coming into the season. A four touchdown lead heading into the locker rooms. Everything was coming up Milhouse. When the third quarter mercifully came to a close, the Rams had done something that I had never seen in a football game in my entire life - they followed their best half of the season with one of their worst quarters of all time. I honestly thought that we were looking at the end of the Ram season. The breaking point of what has been a tumultuous, at best, season. We were now the bottom 10 FBS team. Mike Bobo was on the cusp of getting his pink slip. Fold it up and forfeit the remaining games. To their credit, the players have responded well throughout the season after getting their teeth kicked in. The biggest problem is that the team has gotten their teeth kicked in EVERY DAMN GAME. But the players kept playing and in the fourth quarter displayed their resilience. The team regained their composure, scored another 14 points, and secured the victory. But holy hell - what was that third quarter all about? I am lost when it comes to understanding where this team is at. They have shown flashes of being a team that could be competitive in the Mountain West Conference while sustaining long stretches of absolute garbage play calling and execution. Is the team trash? Or are they better than their lapses indicate? Either way, I have resigned to the fact that there will be no bowl game. Nor will there be a trophy in Canvas Stadium when the season ends. Instead, I will have an accelerated heart rate and grayer hair. Last game's recap started with me stating: If your idea of a good time is sitting on a roller coaster for 4 straight hours twisting a giant knot into your stomach, then you loved watching this game. Naturally, CSU's next installment of "The Grind" was centered around a Joe Cox penned piece titled "Roller Coaster". Thanks for reading the blog, Reno. This past weekend was Homecoming and everything about this weekend makes me happy. The cool, fall weather. The packed stadium in the heart of campus. College football. Having all my siblings and their families at the game. Seeing old friends during tailgating, on the concourse, and in the stands. Homecoming is awesome. The game allllllllmost ruined that. Almost. Like the roller coasters in the mind of Joe Cox, a 14-0 lead turned into a 17-11 lead which turned into a 18-17 deficit which turned into a 4th and goal at the 2 inch line with 2:33 remaining which turned into an 18 yard Wyatt Bryan field goal attempt that went wide. The delight of the day disappeared. Armed with three time outs, CSU's defense took the field. Three yard rush. CSU time out. Two yard rush. CSU time out. Then, the Lobos decided to help CSU out. An incomplete pass on 3rd and 5 and the clock was stopped as New Mexico was forced to punt. Eleven plays, sixty five yards, and two minutes and one second later, Wyatt Bryan pushed the pigskin where he had missed before and the Rams were celebrating a Homecoming victory instead of a Homecoming defeat. A freaking roller coaster. Not to be outdone, we entered the stadium on a beautiful autumn day and left the stadium with the wind whipping, leaves being ripped from the trees, and a monstrous snow storm bearing down on the front range. Even the weather got the memo that this week was about roller coasters. With the victory over the Lobos, the Rams now sit at 3-4 (2-1 in conference) with a short week to get ready for their next opponent. This Friday, they travel to Potatoville to play the pesky Broncos on the Smurf Turf. Boise State is a team that CSU has never beaten. Ever. But I remain optimistic - mostly due to my natural inclination to view things in a positive light. But if this season has taught us anything, it is that I am not allowed to be a fan of good teams the Rams are a resilient bunch. Despite the sub-par offensive line play, KJ Carta Samuels continues to find ways to stay upright and get the ball downfield. Despite the lack of holes generated by those big uglies, Izzy Matthews, Marcus McElroy, and Marvin Kinsey continue to scrape and claw for every inch when their number is called. Despite the early drops in the game (including a perfectly thrown deep ball that was the easiest six points he might ever see), Preston Williams came back and caught the big passes thrown his way when the game was on the line. Despite their early season struggles and the ridiculous number of explosive plays given up, the defense continues to fight hard to stay in games. The defensive line was noticeably improved this week against a option-prone team that typically gives the Rams fits. The resiliency and fight of this team keeps me excited about how this season can end up. Five games remain. Let's win them all. If you look at the offensive production from both squads without knowing the score, it would be tough to tell the final results. Inability to sustain drives by converting third down plays. Costly penalties. Most importantly - negative three on turnover differential. You cannot expect to compete with the Boise States of this conference without disciplined, smart football. I clearly did not expect to win this game - I picked the Rams to lose at the beginning of the season (go me). But the frustrations are mounting. Last year, we had the Broncos on the ropes - the Rams up 14 at home with less than two minutes to play. The marquee win over an opponent they had never beaten was there for the taking and it slipped away in overtime. A year removed from that season-defining collapse and the Rams get routed by those very same Broncos. Is a recovery from this regression even a possibility this year? As for the actual game analysis - it is the same as every other frustrating loss this year. The offensive production statistically matched the Broncos, despite the fact that the offensive line struggled yet again. The defense had too many inexcusable explosive plays. Yada yada yada. Rams lose. But I am an optimist. I yearn for the upside. And there are positives, despite the prevalent negativity surrounding the program. Rashad Ajayi is a legitimate collegiate cover cornerback and HE JUST TURNED 19 YEARS OLD. Collin Hill played the end of the game and he looked the best he has looked all year. Coming off his injury, it was clear early on that his timing was off and he did not fully trust his healing body. His throws late Friday looked like the throws we have come to expect from the highly touted slinger of pigskin. He looked good enough to be named the starter for this week. Preston Williams (despite his uptick of drops in the last couple weeks) continues to be a man among boys. No corner is good enough to cover him or big enough to physically compete with him on one-on-one plays. Warren Jackson gets better every week. He looked dangerous against Boise State. And it is Border War week - a week that we all agree that yellow and brown are colors made for inside of toilet bowls and not collegiate football uniforms. Wyoming is having a down year themselves, losers of four straight and currently the bottom of the Mountain Division of the Mountain West. Wyoming's defense is solid, but have struggled offensively. Our offense has stretches of being above average and our defense has looked slow. Strength against strength. Weakness against weakness. This game is a must win for the Rams. Mike Bobo coached Rams teams are horrendous in trophy games. He needs to do better. The offensive line has a challenge against a stout defensive front. They need to do better. The defense has an opportunity to play a mediocre offense. They need to do better. The Boot has resided in Laramie the last few years. It needs to do better. That starts by moving to Fort Collins. Get the Boot. On November 7, 2015, the CSU football team traveled to Laramie for the annual Border War match-up between the Rams and Cowboys at War Memorial Stadium. 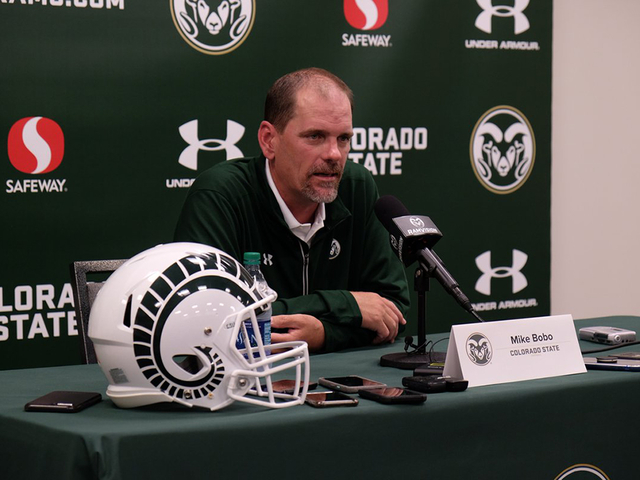 We were in the infancy of the Mike Bobo era at Colorado State and the Rams' record sat at 3-5. Wyoming was having a down year and the game was pivotal in the trajectory of the Ram football program under their new head coach. Fast forward to October 26, 2018. The Cowboys of Laramie traveled to Fort Collins for the annual Border War match-up for the first time ever at Canvas Stadium. 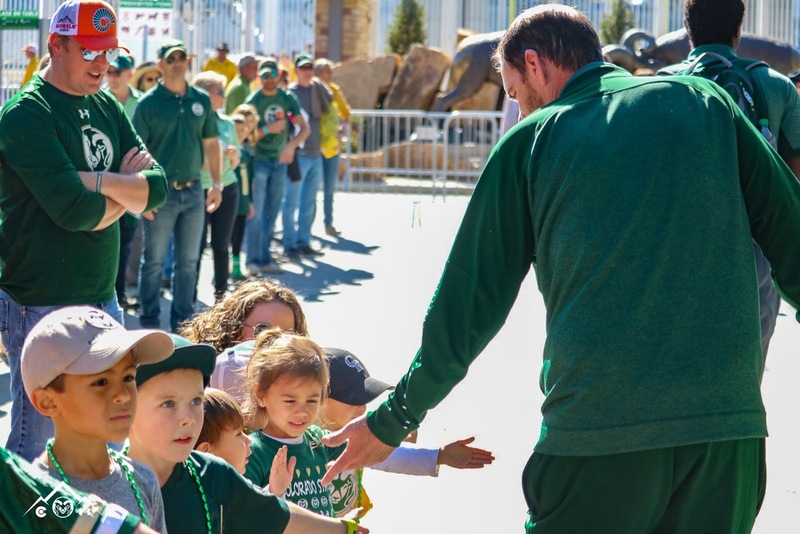 We were in year four of the Mike Bobo era at Colorado State and the Ram's record sat at 3-5. Wyoming was having a down year and the game was pivotal in the trajectory of the Ram football program under their head coach. On November 7, 2015. 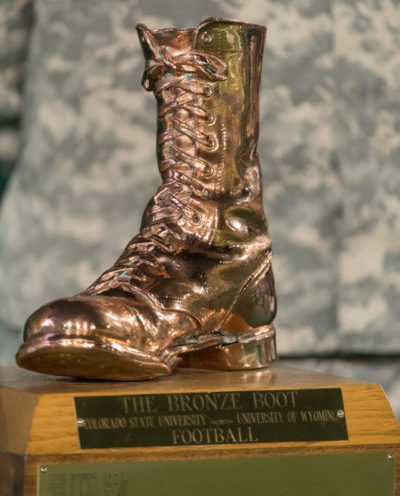 CSU walked into War Memorial Stadium, thumped Wyoming 26-7, and brought the Bronze Boot to reside in Fort Collins for the year. The Rams went on to finish the season strong, compete for a 7-5 regular season record, and earn a trip to the Arizona Bowl - which they ended up losing to Nevada. On October 26, 2018, Wyoming waltzed into Canvas Stadium, thumped CSU 34-21, and took the Bronze Boot back to Laramie where it has lived for the past three years. November 7, 2015 is the last time that CSU won a game with hardware on the line. November 7, 2015 is the second and final time that CSU has won a game with hardware on the line with Mike Bobo as the head coach. November 7, 2015 is too damn long ago. Tell me if you have heard this one before: the Rams were out-coached, the Rams had poor tackling, and the Rams offensive line was offensive. The first half was a slogging, slow, defensive mess that ended mercifully after 9 drives that ended in punts, one made Wyoming field goal, and one missed CSU field goal. The second half started with a Wyoming touchdown and it escalated from there. A couple late garbage-time scores made the final look closer than it was, but this game was over early in the third quarter. Just embarrassing. It appears that the poor performance and poor results are getting to the staff and the team. Exhibit A: Mike Bobo's post-game press conference. Exhibit B: John Jancek and Tre Thomas getting into it on the sidelines. Exhibit C: My daughter's requested portion of my tweet. Love watching the Rams get smoked by a terrible Wyoming team. There are three games left on the schedule (at Nevada, Utah State, at Air Force) and wins should be expected in zero of them. The season will most likely end with a five game losing streak and a final record of 3-9. Aren't sports fun?!! I have reached the point in the season where I do not even know what new words can be used to describe the action on the field. Every critique of Saturday's nightcap has been said above in the previous nine game recaps. Porous offensive line. Porous secondary. No push on the offensive line. No push from the front seven. Bad timing on passes. No run game. Bad tackling. Bad angles. Bad decisions. Bad playcalling. Bad. Mike drinking in sorrow. It is the same thing every game. A cute story to take away the bitter taste of this season: Sarah and I were cooking dinner and the boys were playing football in the adjacent living room. I heard Carson say something, so I went over to confirm. "Carson, what did you just say?" "I said, 'Touchdown Izzy,' Dad." "I thought that is what you said." Am I a terrible parent for getting my kids hooked on CSU football at an early age? Or am I a great parent for teaching my kids how to lose? You pull up the website to check on your recently purchased Powerball ticket. No one had won for weeks and the jackpot had quickly jumped up to over a half of a billion dollars. You grab your ticket and start comparing numbers. One number matches. Two numbers match. Three numbers match! Four numbers match! Five numbers match! THE POWERBALL MATCHES!!! Elated at your newfound life of financial security, you recline back into your chair and take another look at that glorious winning ticket. Your ticket is a Mega Millions ticket. Eligibility Lost by Going Out of Bounds ARTICLE 4. No eligible offensive receiver who goes out of bounds and returns in bounds during a down shall touch a legal forward pass while in the field of play or end zones or while airborne until it has been touched by an opponent or official (A.R. 7-3-4-I, II and IV). [Exception: This does not apply to an originally eligible offensive player who immediately returns inbounds after going out of bounds due to contact by an opponent (A.R. 7-3- 4-III)]. If he touches the pass before returning in bounds, it is an incomplete pass (Rule 7-3-7) and not a foul for illegal touching. With only eight seconds on the clock and the line of scrimmage at the 34 yard line, Williams was running toward the end zone for one last chance at victory. As Williams dipped and made a quick turn to get around the defender, the cornerback got a hand on Williams and moved him to the outside. In the next five or six steps, William's foot landed partially on the white paint. There is no question that the foot landed out of bounds. The frustration lies in the judgment call of the officials on whether or not Williams was forced out of bound by the defender. The officials said no, the touching was illegal, the rules dictate a loss of downs, the clock had expired, and the euphoria from minutes prior turned to heartbreak. It would have been wonderful to give the 18 outgoing seniors a final victory at Canvas Stadium as they wind down their collegiate careers. Among that group of departing players are grinders - the guys who are not the flashiest men on the field but consistently produce. Izzy Matthews - Carson's favorite player and a tough-running, big-bodied, bruising SOB. While this year was a down year and the season has been tough to watch, I hope that the fight and execution and discipline from Saturday is a sign of things finally coming together as we close out the 2018 season. I will not lie to you, my four faithful readers. With the game on Thanksgiving, the hustle and bustle of the following weekend, and the depressing nature of the season, I nearly forgot that I was due to close up the season with one final game recap. At least I have had plenty of time to push this game (and this season) out of my brain to focus on better things (Avs, Nuggets, David Dahl's honeymoon pictures, etc). The Rams went to the Academy fresh off their most complete game of the season - the defeat snatched from the jaws of victory at home against the other team that struggles to beat Boise State. The same day that CSU was ripping our hearts out, Air Force was blowing a fourth quarter lead against Wyoming in the frigid wasteland of Laramie. I had hope that Bobo and his squad could extend the trajectories of both teams from the previous week to end the season on a high note, get some momentum going into the offseason, and bring home one (1) single lonely lousy item for CSU's empty football trophy case. As it was Thanksgiving and I was unable to make the short trek to Falcon Stadium for the game, I enjoyed the start of the game during nap time from my living room. The announcers mentioned early in the contest that CSU, traditionally playing a 4-3 defensive front, was implementing a 3-4 system to counter Air Force's triple-option system. They did clarify that this new defensive alignment was something that CSU had been installing all season, but it did not provide a ton of good feelings knowing that a) our defense had not played well in their BASE system all year much less a new system, b) the defensive coaches had a short week to game plan, and c) CSU historically has no idea how to defend a triple-option attack. The adjustment worked in containing option 2 (running back) and option 3 (quarterback). Unfortunately, Air Force only needed option 1 (full back) and seemingly ran 78 straight fullback dives that resulted in 260 yards rushing from junior Cole Fagan, an Air Force record for fullback rushing yards in a single game. SO MUCH FUN!! Despite Fagan's career day, CSU never looked out of the game as we have seen often this year. Their largest deficit of 14 points came early in the second quarter. After the first of three Preston Williams touchdowns and the first of two missed PATs by Wyatt Bryan, CSU kept the score close. With ten minutes left in the game, Preston Williams scored his third touchdown of the game and Wyatt Bryan's blocked PAT would have knotted the game at 20. A late touchdown on a methodical 75 yard series by Air Force put the Falcons up by eight. CSU did not flinch and marched down the field for the tying score. The drive ended on a poorly thrown interception from KJ Carta-Samuels, who was on the field due to a Collin Hill concussion earlier in the game. This was the second interception of the game (Hill had the first one) and both interceptions came as the Rams were threatening to score within 25 yards of the end zone. The Falcons ran out the clock and mercifully ended Mike Bobo's most frustrating year as a head coach. Looking back, this game was a microcosm of the season. Preston Williams was the best player on the field, hauling in 12 receptions for 248 yards and 3 touchdowns. CSU had 8 penalties for 85 yards. Air Force had one 15-yard penalty late in the game. Air Force found a weakness in the center of the defense and exploited it for 260 fullback rushing yards. CSU's rushing attack netted a measly 2.7 yards per carry. The two-headed CSU quarterback machine was under pressure most of the game, threw for a bunch of yards, kept things close, and had two terrible passes intercepted as they were threatening to score. I spent most of the game yelling at the offensive line and the end of the game shaking my head. Thanks to each of you who have followed along with my viewpoint on CSU football. Of course I decided to do this during the worst season since Steve Fairchild was coach. Despite the crappy results, I had fun this season. I love college football. I love the people that go to the games with me each week. I love the tailgating traditions that we have. I love our stadium. I love being on campus. I love the players that leave everything on the field. And I love writing about what we all saw. As always - Go Rams! !